Fascinating! Folktales! Punjab! These three words together instantly captured my attention. I was further hooked when I realized this set of three board books was for children. As a mother of 1-year old twins and an educator, I am always on the lookout for new resources for Sikh parents to add to the bookshelves in their homes or classrooms.I quickly placed my order. I was returning from a trip couple weeks back, and it had gotten very late. When I walked in the door, I saw that the box had arrived and, despite the hour, I opened it right away. Each book printed on sturdy boards that my twins can handle without fear of paper cuts on their tiny fingers or damage to the pages themselves, is richly illustrated with lavish, mesmerizing scenes of the natural wonders. Trees, plants, birds and animals that do not wander through my yard in Texas are at home on these pages. After admiring the illustrations, I began reading the stories themselves. These are not quite your typical nursery rhymes and not quite your Aesop’s fables. Rather, they are a mix of both— Fascinating Folktales of Punjab is a genre of its own, with easy, memorable rhymes, and lively characters whose adventures carry deeper meaning on human morality for children and adults enjoying the books together. 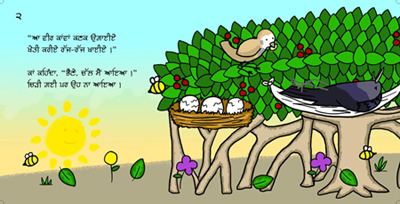 Book 2- ‘Chireetekaan’ brings back memories of my granny telling me and my cousins stories about the innocent sparrow and the cunning crow. Though I don’t remember this particular story, the stories just like this one were always about making arrangements for food. The crow would try to outsmart the little sparrow, but hard work would pay off for the sparrow in the end. My personal favorite of the three is the tale of ‘Leila and Dhol.’ This little lamb heads off to granny’s house, excited to feast on the wonderful treats and sweets that grandmothers always seem to have around. Along the way he meets some dangerous and hungry animal folk,who see him as a wonderful treat. Cleverly convincing them to wait to eat him until he’s plumped up at Granny’s, Leila makes the journey safely. Once there, Leila eats to his heart’s content, momentarily forgetting what is in store for him upon his return journey. As the time comes to head back,he becomes very sad and Granny comes to the rescue. This is a perfect place in the story to pause and ask a child what kind of solutions they would come up with to get Leila home safely. Continue reading and you’ll find out what Granny has in store. As an educator and a curriculum developer, I was particularly focusing on vocabulary potential in the stories, and was pleased that the stories were written with a pleasant repetitiveness that would stick with young children as they listened to the tales, surely demanding to hear them many more times after,each time picking up the plethora of vocabulary. The beauty of each of the books is its own! The sheer variety of vocabulary woven into each story makes these books an invaluable resource to any parent or teacher in the home or classroom. While enjoying the stories with adults, children can learn the words for so many different animals, trees, and colors,effortlessly adding them to the bank of Panjabi words they are building in the flexible young minds. Besides the Panjabi words themselves, and illustrations that give opportunity for new vocabulary development,non-native speakers will pick up on more subtle vocabulary complexities that allow them to express their own thoughts in Panjabi more precisely. It can be difficult for instance to think how to choose the right words or phrases to convey an idea like “the mouse gnawed on the string” but Book 1‘the Sparrow and the Pippal’ helps with that. Soon children will be reading out loud with you or finishing the last line of certain rhymes! Such a treat to watch the language confidence of our youngsters grow before your eyes! Having read all three books now, I am excited to add Fascinating Folktales of Punjab to our family’s collection. Besides a chance for me and my husband to read to the twins, my in laws, who are more cultured with Panjabi roots than I am, will be able to appreciate these stories when they visit.By sharing their own perspective and memories of the stories with their grandchildren, these tales can help bridge the gap over some of our cultural differences. I hope the illustrations will give them an opportunity to share with the children some memories of their childhood in Panjab and open the door for them to tell more stories to my children as well, passing on a generation of knowledge that might be lost. I know we’ll be using these books for years to come too! As the twins are only 1, they are a little young for the on-line activity sheets that you have access to when you buy the books, but in a few years these sheets will add a whole new dimension of interaction with the books! These sheets are recommended for children ages 3-7 years old who want the opportunity to work individually or with an adult on activities that enhance the vocabulary in the stories, and give opportunities to develop critical thinking skills through questioning. The activity supplements are full of fun learning exercises that will keep the children busy and engaged around kitchen tables and in Panjabi schools around the world. Jasmine Kaur is the Sikh Research Institute’s Director of Education. She has worked in the education field for 15 years. Her degrees are in elementary education, sociology, human development and family studies. Her passion is developing creative & interactive activities for all ages, especially young children. Jasmine serves as the lead coordinator for Sidak—SikhRI’s unique and highly popular two-week leadership retreat. She is the chief coordinator for Sikh Educators Network. Her articles on activities for children, the future of Sikh education and reflections on her own experiences growing up Sikh in Japan, India, Canada, and the US have been published online and in print.